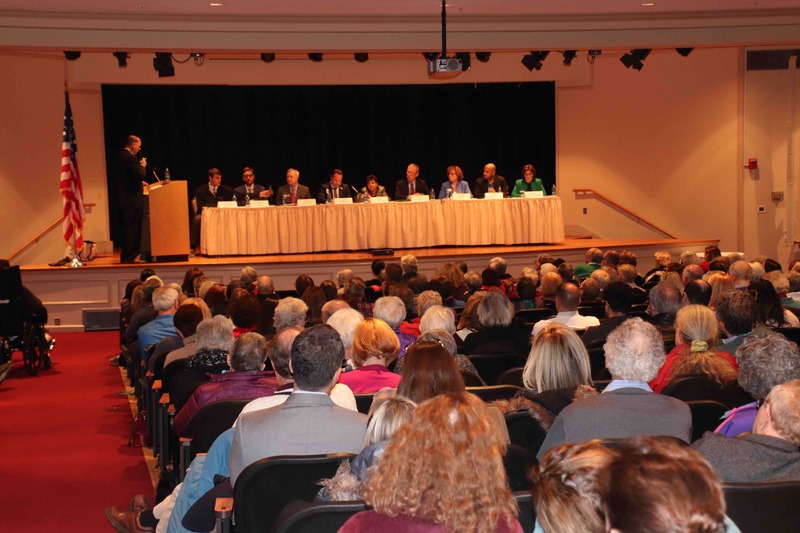 Last night, the nine candidates for the open District 1 Council seat debated at the 4-H Center in Chevy Chase. It was a lively and substantive debate that gave the audience of over 220 a real sense of issue differences as well as a more personal sense of the candidates. Moderator Charles Duffy pressed candidates to expose issue differences to good effect. From my vantage point, former longtime Kensington Mayor Pete Fosselman gained the most from the debate. Less known outside his bailiwick, Pete has a strongly pro-development reputation through his involvement in the Kensington sector plan. The debate revealed both real knowledge and a much more nuanced approach that was not anti-development but would buffer existing neighborhoods and place development near transit. He pointed out that the Council upzoned Westbard even though it’s not near Metro. (It would be a logical stop if the Purple Line were extended west to serve Bethesda from both directions.) Pete had a style that showed conviction but also came across as thoughtful. Former Planning Board Member Meredith Wellington has a real well of grassroots community support. Active in the community in opposing over development that tramples on existing neighborhoods and does not provide infrastructure to support it, she touted that she is not taking developer contributions. Like Marc Elrich, she has a real ability to talk fluently about the planning process that nonetheless remains comprehensible to voters—no mean feat. Meredith’s argument against lowering standards as a solution to failing infrastructure tests—one my students would love—was devastating. Her calm, thoughtful approach strongly appealed to an audience that wants a say in the future of their community. Pumping up the strength of her delivery would further expand her appeal. While Pete and Meredith had good nights, Del. Ana Sol Gutiérrez—normally an excellent debater—foundered. Even as Ana advertised her Chevy Chase residency for the first time in my recollection, she showed no sympathy with many community concerns. For example, she argued against new parks in Bethesda and essentially said that the Ag Reserve is Bethesda’s open space. Ana had worst moment of the debate as her effort to shift blame from state legislators to the County for insufficient school construction funds rebounded. She argued that the delegation was not organized and the County “wasn’t there” to make the case that Montgomery cannot afford to do it alone. Reggie Oldak called her “disingenuous,” as Ana left voters wondering why this Appropriations Committee member hadn’t addressed these problems after 16 years in the legislature. Though a first-time candidate, Andrew Friedson sounded the most like a politician. On the positive side, he spoke commandingly and with confidence. Perhaps unsurprisingly for a former employee of Peter Franchot, he made the most articulate economic argument for why the County liquor monopoly needs to go. However, Andrew’s claim that he is “proud” of all of his donations in response to probing on his heavy developer support sounded unconvincing, evasive and overly smooth. While he repeatedly mentioned his business and labor “coalition,” Andrew noticeably did not highlight neighborhood or community support. At times, he seemed more comfortable with generalities than policy specifics. First-time candidate Dalbin Osorio made a strong impression. Talking about how he moved here for the schools—he and his wife are expecting their first child–he came across as someone who understands the community’s ambitions well and would advocate fiercely for it. Like Andrew, Pete, and Meredith, he’d get the county out of the liquor business. While not seen as a leading candidate, I hope he stays involved regardless of how the election turns out as he struck me as exactly the sort of up and coming candidate we need. Bill Cook was the most stridently anti-development. His major contribution to the debate was challenging the Stockholm Syndrome that the community has no power and must do whatever developers propose. He attacked the role of money in politics and said it’s no coincidence that both the President and the Governor are developers and that incumbent District 1 Councilmember Roger Berliner has raised hundreds of thousands from developers. Jim McGee argued that “the system” is currently not working for a lot of people in the county, a theme that resonated among voters in the district who feel that the Council simultaneously manages to ignore both struggling families and trample on communities. Like Ana and Bill, he opposed privatization of the DLC. He emphasized climate change and wants to see more green space in Bethesda, as do many other candidates. Lone Republican Richard Banach is a political science major who admitted candidly and with humility that he didn’t know much about many of the issues. While he still has a lot to learn, he struck me as a shoot of hope from the Republican Party. If Robin Ficker is the past, thoughtful candidates like Banach will hopefully be the future of Montgomery County Republicans. Thanks to the Town of Chevy Chase for organizing the Forum. I know Pat Burda among others put a lot of work into putting it together. Kudos also to the many interested voters who turned out to learn more about the candidates.